I spent the early part of this week at SAS’s annual analysts conference, where the company reviewed the past year and presented its vision for 2012. The story this year was simple: “big data”, and SAS’s “high performance analytics” approach to taming it. Of course, “high performance analytics” is what SAS has always done and, like “big data” itself, the term is relative. What SAS specifically presented was a re-engineering of its core analytical procedures to run in “shared nothing” multi-processor environments. Each data set is split into pieces that are loaded into separate units, processed independently and simultaneously, and then brought together for a result. SAS cited tremendous performance improvements, such as reducing the time to build a loan default model on a billion rows of records from 11 hours to 50 seconds. This obviously makes possible new, tactical applications. The high performance architecture is becoming available in stages as each SAS procedure is rewritten to support it. The change from a customer perspective is purposely minimal: existing SAS procedure calls are simply modified by adding a "HP" prefix. This will make it easy for clients to take advantage of the new capabilities. The company revealed a just a few new products at the conference, most notably a Visual Analytics tool that uses in-memory processing to render billion-row data sets in seconds. But the real benefit of high performance will come less from new products than from using it with existing SAS procedures and tools. The SAS product that may benefit most of all is SAS Decision Management, which creates rule-based decision flows that can call on scoring models and other analytics to help guide tactical processes. The product itself isn’t new, but high-performance analytics will let it do new things. SAS’s “big data” story also included Hadoop integration and expanded cloud deployments. By the end of March (if I understood the roadmap correctly), SAS will be able to read from and write to Hadoop data sets, embed Hadoop commands within SAS scripts, and send SAS metadata to Hadoop. Over the coming year, it will support cloud deployments through a variety of enhancements related to virtualization, open APIs, and eventually an app marketplace. The cloud-based initiatives also support SAS’s own on-demand business, which grew 57% last year to reach more than $100 million. These are all positive developments for SAS, which must certainly support "big data" to remain relevant. The new capabilities will also create some business changes as SAS competes more directly with companies like IBM and Oracle to embed analytics within operational processes. SAS itself noted the company is now more involved in architectural discussions of how its systems interact with the rest of the enterprise infrastructure. Other issues may include educating non-technical users and providing technology to protect privacy. SAS leaders seem to think they can leave those issues to others, but I’m not so sure. The conference produced little news directly related to marketing systems. The company reports 38% growth in marketing applications – which it reports under the label of “customer intelligence” – so that is clearly a healthy business. But the product road maps showed just incremental improvements of existing products, without any major new offerings. Again, high-performance analytics will make new things possible without other changes in the products themselves. The high performance version of marketing optimization is due by the end of the year. If you want more evidence of how little attention was paid to marketing systems: SAS's biggest recent piece of marketing-related news, last week’s acquisition of online ad server aiMatch, got exactly one mention during the day-long presentation and was positioned as simply filling a small gap in the marketing product line. The company did announce, very casually, that aiMatch would be extended to include ad buying optimization as well as its current ad-selling optimization. That struck me as a pretty big deal, since ad buying is the heart of an already-huge industry that’s clearly the future of marketing. Then again, it’s also an intensely competitive, heavily-funded space that’s crawling with advanced technologies. Although SAS's high performance analytics could have a huge impact on ad serving, that won't happen unless SAS makes a major commitment of people and money. We’ll see whether they make one. One of first marketing automation systems I ever saw – this would be during the Reagan Presidency – was a custom-built dial-up network to distribute collateral to farm equipment dealers. This and similar seeds have since sprouted into a forest of products that help brand marketers work with dealers, distributors, franchisees, and agents. Some of these channel marketing systems focus on lead distribution, some on locally-customizable promotion materials, and some on campaign management. All must mediate the delicate relationship between relatively sophisticated central marketing departments and their firmly independent channel partners. These products are part of the marketing automation industry, although their specialized nature places them on the periphery. General purpose marketing automation vendors also compete for this business with what are usually called “distributed marketing” options. I keep a distant eye on the space because it’s relevant but there are too many choices to track it closely. The best I can do is make an occasional visit to see what’s new. I made my latest foray last week after a briefing request from Balihoo. I accepted partly because Balihoo labels itself as “local marketing automation”, which includes the two magic words that most pique my interest. More important, channel marketing issues have cropped up several times recently in my consulting and are likely to be even more prominent in my work at Left Brain DGA. So it was worth taking a look. I’m glad I did. Balihoo is an impressive product that combines localizable (is that a word?) content distribution with pre-packaged campaigns in email, direct mail, mobile, online ads, print, and broadcast media. It also helps local partners set up their own Web sites and social network accounts, register with local directories and search engines, and record telephone as well as online responses. The company says these latter features are unique, and a couple hours of my competitive research seemed to confirm this. As Balihoo’s tagline suggests, it is designed to provide a marketing automation system for each channel partner. Users set up a “my info” page with contact information, store hours, directions, and other details. These are then pulled into promotion templates as needed, meaning that much localization is fully automatic. This saves effort, ensures consistency, and simplifies changes. The system also stores a customer list – owned by and only accessible to the channel partner – which can function as a simple CRM system. The heart of Balihoo is wizard-driven processes to set up different kinds of marketing campaigns. These can include “negotiated” media such as television, newspaper and radio ads, which are purchased and trafficked by Balihoo on the buyers’ behalf, and "non-negotiated" media, such as printed mailers, email messages, and Web search ads, which local marketers can purchased directly. In all cases, the campaigns are set up by central marketers as templates that determine which elements, if any, the local marketers can change. Templates can include predefined options, such as a list of standard offers, that give local marketers some choice without allowing them complete freedom. The system can also require central approval before a campaign is released. In addition to one-off campaigns, local marketers can subscribe to on-going programs such as a recurring “new movers” mailing based on purchased lists. The system supports event-triggered and multi-step campaigns, although Balihoo has found that most local marketers balk at entering the response details needed to maintain them. Balihoo can automatically apply co-op dollars to locally-selected campaigns, billing local partners only for the net amount due. This is a major benefit by itself, compared with the usual method of having channel partners lay out the funds and then apply for reimbursement. When central marketers feel a particular program is extremely important, they can even fund it fully themselves. The system also provides detailed response reports, including recordings of telephone responses – which the company has found are much more important for local companies than national marketers. Even though customer data remains with the channel partner, Balihoo inserts tracking codes and captures aggregate response information so it can judge the effectiveness of different programs. Balihoo is purchased by the central marketing department and delivered on a Software-as-a-Service platform. Brand marketers can reskin their instance to give it a company identity. Pricing is based on the number of local marketers who use the system. A typical big company pays $200,000 to $300,000 per year, not including media fees (passed through at cost) and supplemental services such as local registration. These could be paid by either the local partner or the national brand. Balihoo entered the “local marketing automation” business in 2008 and now has more than thirty enterprise clients serving more than 100,000 local businesses. If you’re keeping score at home, it has received $17 million in venture funding. Ok folks – what you just read is a perfectly adequate blog post. I could easily stop here. But remember those several hours of research? I’m not letting them go to waste. Here’s a table that compares features in Balihoo and several competitors. One big caveat is this is based on what I could glean from company Web sites, which don’t necessarily cover everything. - it's worthwhile to distinguish between distribution and syndication. Distribution refers to making materials available for local marketers to download and customize for themselves. Syndication refers to sending materials that are already customized with the local company name, address, and contact information but the local marketers cannot change. Syndication gives more central control and saves the local marketers work. It makes particular sense for automatically pushing materials to partner Web sites. - some systems just do content distribution and/or syndication. Remember that this is the original function of channel marketing automation. There are many more products than I listed here with this capability, and it borders on general purpose digital asset management and content management – sectors with literally hundreds of products. - most vendors also support email and direct campaigns. This is a distinct step up in complexity, since it requires loading and/or purchasing prospect lists. It shares borders with several types of general purpose systems, including email, CRM, and marketing automation. - once you get past basic content distribution and email/direct mail production, features vary more substantially. This is where buyers will need to pay close attention to their current and future needs. - several vendors offer media buying. These may be automated for direct-purchased media or services for media requiring negotiation and trafficking. Either is a big step beyond basic content distribution. - social media support is hard to find. Only a few vendors offer it and they provide different combinations of setting up social network sites for the local business; providing content to share in social networks; and providing tools to post social messages. This could be an important feature for vendors to add: local businesses need help learning how to make social media work. - managing co-op funds is surprisingly rare. You’d think this would be a common feature, since it's a logical extension of content distribution. But either the vendors just don’t talk about it on their Web sites (unlikely) or they’ve found that clients have other ways to handle it. I’m dimly aware that there are specialized co-op accounting systems – but that’s a corner of the forest I’ve never explored. - services vary greatly. From a vendor viewpoint, the purpose of services is to remove roadblocks that prevent clients from using their systems. As a result, services vary depending on the features the vendor is trying to support. The list includes creating marketing materials, buying media, managing data, training users, executing entire programs, and building custom software. These are exciting times in the world of analytical systems. The Web has created new demands to handle unprecedented data volumes and semi-structured data. Cloud-based deployment offers near-infinite hardware scalability and flexibility. Acquisitions by enterprise software giants have opened opportunities for smaller, more nimble alternatives. The result has been an explosion of companies using new techniques for managing and analyzing huge data volumes. Many, including Vertica, Aster Data, Greenplum, and Netezza, have also been assimilated by enterprise vendors. Others, including Paraccel, Kognitio, SAND Technology, and 1010data, have grown steadily while remaining independent. Quantivo is part of this latest technical flowering. Its core is a data structure that sits somewhere between columnar – now the most common approach for analytical processing – and hierarchical indexes. Specifically, Quantivo identifies unique pairs of values within incoming records and stores each pair only once. It then builds new pairs by identifying unique combinations of each pair with another element (which might itself be previously-identified pair). For example, the first analysis might find all transactions that involve a specific product on a single date. The second pass might find all transactions with that product/date pair that were made by a given customer. The process repeats, working up a hierarchy of combinations. The system also tracks the number of times each pair occurs and the specific records involved, so the full detail of the original data can always be reconstructed. The system doesn’t build pairs for all possible combinations of data elements, although users can define several hierarchies if they want the same element to be part of several pairs. Indexes also allow analysis across pairs that are not directly built into the data. Quantivo doesn’t hide the details of its approach, but it doesn’t talk much about them, either. This likely reflects a (correct) judgment that users will care more about the system’s benefits than how it works. Those benefits include data compression (typically 10% of the original volume), fast response, high scalability, flexible schemas, handling unstructured data, and efficient processing of queries that cause problems in standard SQL. The choice of hierarchy also inherently organizes data around “concepts”, which can be different from the physical structures of the inputs. Queries are relatively simple because users see only a flat list of data elements; relationships are managed automatically, behind the scenes. Yes there are trade-offs. The data must be processed during the load – a computation-intensive task that takes longer than creating a simple columnar database. The schema must be designed, which requires some technical expertise and can lead to slower response for queries outside the expected paths. Non-SQL queries require a Quantivo-built user interface, meaning users cannot stick with their familiar SQL-based business intelligence tools. Some of these issues are mitigated by Quantivo’s other major differentiator: it was designed from the start as a true multi-tenant cloud-based solution. This means it can easily spread its workload across multiple servers and replicate data as needed to support higher data volumes (billions of rows), reduce load times (typically one to two hours per day for daily updates), and improve response time. Support for multiple hierarchies and queries across hierarchies also minimize the price of making a bad decision during initial schema design, since even unplanned queries will execute reasonably efficiently. Designing a schema is relatively simple: in fact, Quantivo plans to add self-service data provisioning, including schema design, in the near future. The Quantivo user interface is purposely designed to look like other business intelligence tools: users get a list of measures and dimensions, which they drag into place to create pivot tables. They can create filters, define calculated values, add summary levels, and drill down to details. There are simple graphics such as bar and pie charts, but no advanced visualization. The unique power of the system lies within the filters, which can select data that’s outside the standard dimensions. For example, a filter could select all transactions for customers who purchased a specific product – the type of market basket analysis that’s hard with traditional SQL queries. The system also calculates “association metrics” which compare the data across two groups, such as products in the baskets including product A vs. products in baskets including product B.
Quantivo pricing is based on data volume and complexity. A typical client pays $40,000 to $50,000 per year for 100 million to one billion rows of data, making the system remarkably affordable for a product of its type. Most clients are using the system for customer data analytics, and the vendor has created connectors for SAP, Salesforce.com, Marketo, Responsys, ExactTarget, Omniture, Google Analytics, IBM, Microsoft, and NCR systems. Quantivo launched as a cloud-based service in 2008 and has an undisclosed number of paying clients. You may have seen yesterday’s announcement that Raab Associates’ marketing technology practice* has become part of LeftBrain DGA, an agency specializing in demand generation strategy and execution. My role at Left Brain will be to build the “optimization” practice, which means working on marketing analytics as well as technology. I’m looking forward to deeper involvement in client marketing programs than the project-oriented work at Raab Associates allowed. Left Brain and its clients are eager for the optimization work because many of their programs have now passed their initial deployment and need this sort of analysis and tuning. Left Brain’s readiness for an optimization practice reflects changes within the larger demand generation industry. As B2B marketing automation technology worked through its initial deployments, the industry needed best practices to ensure successful implementation. This meant marketing process definition, marketing/sales alignment, and program strategy. It’s still important to execute those properly, and always will be. But we now understand what the issues are and how to solve them. The next frontier is refining and expanding existing programs, especially at larger organizations (a Left Brain specialty), which have the data volume and resources to support advanced analytics. That requires new best practices and success histories for optimization. That’s exactly what I’ll be working on. It will be fun. If you’re wondering about this blog and my other activities as an industry analyst: my current intent is to continue. My work at Left Brain will still require keeping abreast of technology developments, both for our internal use and at our clients. It’s likely that my topics will shift a bit as my day job revolves more around analytics and less around vendor selection. But, as I just suggested, this probably mirrors a shift of focus for the industry itself. So, if the stars are aligned as I think, my topics will be more relevant than ever. Regarding my traditional consulting work on vendor selection and technology analysis: I'll probably do less of it as other Left Brain work takes most of my time. But I’m still here and happy to hear from people who need help in those areas. If we can’t help you at Left Brain, we’ll recommend someone who can. Finally, there's our VEST report, which is still available at the Raab Guide Web site. We just released a new edition of that, so it will be current for at least six months. What happens after that I can't say: it might vanish, we might continue it under the Left Brain banner, or it might find a new home. But for now it's still a great resource for companies looking for in-depth information on B2B marketing automation systems, so make use of it while you can. Incidentally, my new title at Left Brain is Vice President of Optimization, which manages to be both vague and bureaucratic. I'm thinking I might prefer Lord of Optimization, or maybe just Oracle. Other suggestions are welcome, so long as they're G-rated enough to put on a business card. Maybe we should have a contest. * The rest of Raab Associates, a children's book marketing agency run by my wife, will continue to exist. See her Web site at www.raabassociates.com. NurtureHQ Offers "Dead Easy Marketing Automation". Is That Enough? In other words, this is a worthy alternative to Act-On, SalesFUSION, Net-Results, MakesBridge, Genoo, and other small business systems. Definitely take a look if you’re in that market for that sort of product. But there’s my problem: “that sort of product” is widely available already. NurtureHQ hopes to differentiate itself as “dead easy marketing automation”, which it arguably is. But is it so much easier than the other products I just listed? I think not. Regardless of whether it’s the easiest of them all, the difference isn’t likely to be large enough to matter. Naturally, NurtureHQ disagrees. Before building its system, the company spent six months talking to current marketing automation users. Many said they never progressed beyond email because the next step was too hard. This led NurtureHQ to believe that an even easier system could find a broader market than current products. Other vendors have asked the same questions and reached the same conclusions. But I’m beginning to think those marketers were really saying something else. What they found “too hard” wasn’t the software, but the planning and content creation needed for serious marketing automation. Without a clear understanding of what they wanted to do, they couldn’t figure out how to get the system to do it. That’s not a software problem. Even a system that could build programs just by reading marketers' minds wouldn’t work if those minds didn't know what they wanted in the first place. This isn’t a new insight. Marketing automation gurus have long argued that companies need to define their processes in advance of deploying a new system. The case was made yet again this week in an excellent blog post by Joby Blume, describing his former company’s struggles with marketing automation. (Be sure to read the comments). Howard Sewell of Spear Marketing Group made a similar point on his own blog. I reached the same conclusion myself in a post using data from a Gleanster report on marketing automation. None of this means that “ease of use” is a bad strategy for NurtureHQ and others. On a practical level, ease of use helps sell systems to people who otherwise wouldn’t buy them. But vendors can't succeed if their clients fail – especially they rely on revenue from subscription renewals. So it only makes sense to sell marketing automation to companies without adequate processes, content, and other resources if those companies understand they’ll need to add those resources later. To really ensure success, vendors must actively help their clients through training and, in some cases, services to do the work for them. Vendors including LeadLife, Genoo, and MakesBridge already offer low-cost service packages for their clients. Other vendors also have service arms and agency partners to help out on a project basis. Third-party training resources such as the Marketing Automation Institute (where I’m a board member) can also help to fill the gap and benefit from substantial vendor funding. What does this mean for the software vendors themselves? If the real keys to success are marketers’ skills and processes, does it really matter what’s in the software? To put another way, is marketing automation software already a commodity? I hate to say it, but, to some degree, yes. There are certainly differences among products, both in capabilities and ease of use. But most marketers can find several systems that will meet their needs. This means vendors are increasingly competing on other dimensions including their own marketing and sales skills, cost structures, supporting services, pricing, and financial resources. As I pointed out last week, it’s no coincidence that four of the five largest vendors are venture-funded (six of seven, if you include Infusionsoft and HubSpot). Another factoid that makes the point even more clearly: three of the four fastest growing received major new funding in the past year. Still, I’m not entirely ready to give up on technology as a major differentiator. What’s needed is more radical innovation than a better interface. If the real barriers to success are creating content and identifying appropriate programs, then technology must address those directly. There are some already tools to help generate content, such as systems for news curation and video posting. I can't think of any products that recommend the right marketing programs, but proper analytics can identify patterns that reveal opportunities, and it’s perfectly conceivable that a rule-based system could check for known issues and make recommendations. HubSpot’s marketing grader does a something like this although it only examines externally-available information. Of course, marketers will still have to create content and design programs. But better technology could dramatically reduce the necessary effort and move marketers past the deer-in-the-headlights paralysis of not knowing where to start. Vendors who really want to expand the market beyond the resource-rich few should look in this direction. My last post looked at data from our just-released B2B Marketing Automation Vendor Selection Tool (VEST) to understand general industry trends and identify the greatest areas of improvement. Today we’ll look at the VEST data to see what’s still hard to find. As before, the charts show three columns: change in feature availability over the past year among core marketing automation vendors; current availability among core vendors; and current availability among enterprise vendors. See the previous post for details on the calculations. Split Tests: Formal split testing of different content versions or customer treatments is the heart of marketing optimization, but many B2B marketers still don’t have the time or resources to do it. Given the lack of demand, it’s not too surprising that many vendors don’t offer strong testing features. Still, I feel they have something approaching a moral obligation to provide these features and encourage their use. Note that splits within lists, the one testing capability that is fairly common, is actually the hardest for marketers to use. Testing features are much more available among enterprise systems, whose clients are more likely to conduct tests as a matter of course. Value-Based Selection: This is arguably the next step after dynamic content (see my previous post), since it uses calculated values rather than user-crafted rules to select marketing contents or campaign actions. Like dynamic content, it reduces the complexity of marketing programs while allowing them to be more targeted. It's still much harder to find than dynamic content although it is becoming more available. Again, enterprise vendors have a substantial lead over the core systems. Integrate with Direct Mail Printer: This is admittedly a small tactical issue, but it's interesting in its own way. There’s apparently a resurgence of interest of direct mail generally and post cards in particular as a way to avoid ever-more-cluttered email inboxes and social media channels. This is one of the few features that are more common among micro-business systems than the core group. Project and Content Management: These features are most important for large marketing departments that need coordinate work of many people. Most core marketing automation systems can track the creation and last change date of an item. But serious administration requires much more detailed control over who makes changes, approvals, and project management. As marketing programs get more complicated at all sizes of companies, these features will become increasingly important. Data Quality: These are features that give marketers more control over the data that goes into their systems. Like split testing, data quality is widely recognized as important but often ignored. Availability of these features actually went down last year because several new core vendors provided below-average support. Enterprise vendors, with their more sophisticated client base, support these features fully. Data Management: These features each reflect a certain degree of data management sophistication, although there’s a reasonable case that a separate company table doesn’t matter much in practice. The opportunity table is critical for revenue analysis, and you see here that it’s widely available. Custom tables are needed to extend the marketing database beyond inputs from the CRM system. They used to be fairly rare but are now available in more than half of the core products. But half full also means half empty, so buyers still need to check carefully to ensure a particular vendor supports their needs. Reviewing this list of features, only value-based selection is really cutting edge. The rest have long been standard for consumer marketing automation products and enterprise B2B. They're missing from core B2B marketing automation systems because most of their clients are smaller, less sophisticated companies who haven't needed them. This may never change for vendors focused on small marketing departments. But vendors serving larger companies will add these features as their clients discover they need them. For more information about the B2B Marketing Automation VEST report, please visit www.raabguide.com/vest. Last week's post took a horse race approach to data from our newly available B2B Marketing Automation Vendor Selection Tool (VEST): who’s ahead, who’s behind, and who is coming on strong. But that’s more important to industry insiders than the marketers who actually use these systems. Real marketers care about what the systems can do. The VEST survey, covering nearly 200 items per vendor, answers that question in glorious detail. You need to examine the report itself to see answers for individual products. But aggregate data provides important context for understanding where the industry stands and where it’s headed. Let’s start with the basics. I group vendors into three categories depending on their primary customers. “micro” vendors sell largely to businesses under $5 million in revenue. These include Infusionsoft, HubSpot, and OfficeAutoPilot. “core” vendors sell to B2B companies with $5 to $500 million in revenue. These include LeadFormix, Marketo, Genius,MakesBridge, Act-On Software, Right-On Interactive, SalesFUSION, Net-Results, LeadLife, Pardot, Silverpop, TreeHouse Interactive, Eloqua, Manticore Technology, and eTrigue. “enterprise” vendors sell mostly to companies over $500 million revenue. These include Aprimo, Neolane, and Oracle. As you might expect, products for larger companies have more features available. Remember, though: more features is not always better. A feature important to a large enterprise can make a system less suitable for a small company where the feature won’t be used but still adds cost and complexity. The VEST addresses this by providing different weighting schemes for the three types of customers. These weights reflect the most important features for each category and sometimes apply negative values to features that make a system less suitable for the target group. Scores calculated with those weights show that the core and enterprise vendors do about equally well at serving their target markets. The micro vendors have a little more room for improvement. Speaking of improvement, we can also see how the industry has changed by comparing the new VEST with scores from one year ago. This brings considerable good news: the micro and core vendors are indeed adding features, especially in lead generation, campaign management, and reporting. Enterprise systems are already so powerful that new features don’t matter much. (The decline in “scoring and distribution” for the enterprise category is a bit of a fluke: one vendor was replaced by another with weaker scoring and distribution features. Because there are only three vendors in the group, this has a large impact on the total.). The change in weighted scores shows roughly the same story – so, for the most part, vendors are adding features that matter. But enough generalities. What really matters is specific features. Today I’ll look at the areas of greatest improvement. A later post will list key features that remain hard to find. “change”: the change in feature availability among core vendors, compared with the January 2011 VEST. 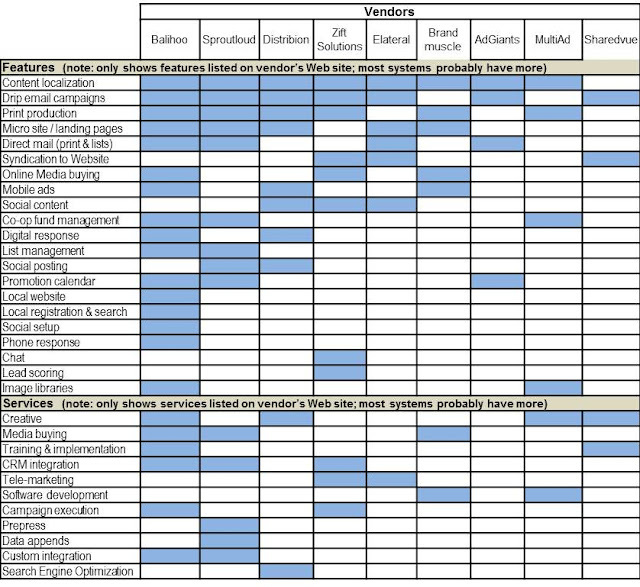 “enterprise”: the feature availability for enterprise vendors in the January 2012 VEST. Let’s start with three areas that gained a lot of industry attention last year: Webinars, social media, and revenue management. Webinar Integration: Webinars are an increasingly important marketing tool, but traditionally systems like Webex had their own registration forms and result tracking. Moving the information into marketing automation required time-consuming file extractions and imports. Last year, the Webinar vendors began to expose APIs to allow automated integration with the marketing automation systems, and the marketing automation vendors leapt on the opportunity. As a result, availability of Webinar integration grew rapidly. This is a rare area where the core vendors outscore the enterprise vendors, perhaps because the enterprise vendors are less narrowly focused on B2B needs and/or because they tend to move more slowly at enhancing their products. Social Media: It’s no news that social media is a hot topic among marketers, so it’s no surprise that vendors are adding features to support it. But even after last year’s improvements, anything beyond basic sharing and tracking remains hard to find. This is another area where the enterprise vendors are lagging. For a more nuanced analysis, see my blog post Social Media Features in Marketing Automation Systems: Who Does What? from last December. Revenue Management: We heard plenty last year from marketing automation vendors about revenue management. The good news is that they’ve backed up their words with features. In fact, it’s surprising how widely many key revenue management requirements are available – many industry leaders can walk this walk, even though a few do most of the talking. Note also that the enterprise vendors do most of this as a matter of course. Okay, those were interesting but expected. What else were vendors working on last year? Several things, it turns out. Reporting: Enterprise vendors have long had better reporting than the core marketing automation systems. They still do but the gap is closing. A separate analytical database is especially important for advanced analytics in general and for revenue management reports in particular. Again, it’s more widely available than you might think. Dynamic Content: This refers to embedding content selection rules within an email, Web form, or landing page. It’s not just personalization, which simply plucks information from a database field, and it’s not segmentation, which uses rules to select different content objects within the campaign flow. Dynamic content lets one email or Web form serve different segments, so marketers don’t have to create and keep track of so many separate versions. As you’d expect, it was traditionally used in enterprise systems where complexity is a more pressing challenge. Core marketing automation vendors didn’t talk about it much last year, but quite a few seem to have added it. Cross-Campaign Coordination: This encompasses several features to help coordinate customer treatments across campaigns. As with dynamic content, these become important when companies are running complicated marketing programs and need to keep things under control. It’s another area where core marketing automation systems are closing the gap with enterprise vendors, although some distance still remains. So that's the good news: changes in areas the vendors talked about plus some changes they didn't necessarily trumpet. Look for my next post to learn where they still need to strengthen their products. Of course, the only thing more exciting than reading my analysis is to make your own. For more information about the VEST report or to order your own copy, visit the RaabGuide Web site. I released the 2012 edition of our B2B Marketing Automation Vendor Selection Tool (VEST) report today, an event that deserves more hoopla that I’ve given it. The VEST provides by far the most detailed, objective information available on industry vendors. It includes nearly 200 data points on 21 products, thumbnail sketches of each vendor’s strengths and weaknesses, and three industry quadrants showing leaders in different market segments. It’s also interactive: you can change the weights assigned to different items and watch the vendors zoom around the quadrant as a result. For those of us who don’t get out much, that’s downright exciting. As you see, core vendors grew almost twice as fast as the micro-business group and considerably faster than HubSpot. There was some speculation last year that the micro-business vendors were growing the fastest. Myth busted. Revenue grew faster than installation counts. The previous table shows that combined growth across all categories is 46%. But that doesn’t mean much because the selling prices are so different. Adjusting for revenue per client, I estimate that industry revenue grew about 55% last year. I could show you my calculations, but then I'd have to...well, you know. New leaders can still emerge, but venture funding is required. A year ago, the three largest core vendors were Eloqua, Marketo, and Genius, and Act-On was an also-ran. Today, the Marketo has more clients than Eloqua (although not more revenue), Pardot has replaced Genius in the third position, and Act-On is coming up fast. It's no mystery why the market remains fluid: venture capital lets new entrants shoulder their way to the top. Of the five top-ranked core vendors, all but Pardot has substantial venture funding. None of the remaining ten core vendors do – and their average growth is much slower. Self-funded firms can survive but it’s unlikely they will become leaders. Specialization is increasing. We ask vendors for client counts in four segments: micro-business (under $5 million revenue); small business ($5 to $20 million revenue), mid-size business ($20-$500 million revenue) and big business ($500 million and higher). Most gave us answers, although Act-On was a prominent hold-out. It’s no surprise that the micro vendors sell almost exclusively to micro clients. HubSpot’s base is much more diverse, although the micro and small sectors still account for 75% of its base. Of the core vendors, Marketo and Genius are the most small business oriented, with the two smallest categories accounting for over half of their customers. Pardot is tightly focused on small and mid-size clients, reflecting their disciplined sales approach. Eloqua has by far the most big-business clients of any core vendor, a proportion that has grown dramatically since the first VEST report one year ago. For more information on the new VEST report, visit www.raabguide.com/vest.